Moooi Carpets reinvents the carpet and opens up new horizons in the design world by introducing a technology that generates extremely high definition prints. All the carpets combine an endless mix of colours thanks to the use of a groundbreaking high definition Chromojet printer and its accurate tones, which generate a playful illusion of depth. For Moooi Carpets Claire Vos designed the Yarn Box Collection, presented at Salone del Mobile 2019. Cor Unum is a ceramic art centre founded and based in ’s-Hertogenbosch, The Netherlands. They develop and manufacture our products designs and we love this unique company! Cor Unum takes social and cultural resposibility for the legacy of the ceramic crafts. Their mission is brought to the market through a team consisting of professionals, students, volunteers, people with distance from the labour market and designers. They all share one common passion: everyone deserves a place, everyone has got a talent and anyone can contribute to make the world somewhat nicer. Most of our design projects are commissioned. But sometimes we feel the urge to create something by ourselves because we simply want to. In our previous project we were creating hexagon shaped tiles. The shade, lines and reflection on these tiles made us realize that we could use this concept for a light object . Primary linear forms do very well especially when the reflected light reveals the beauty of a shape. 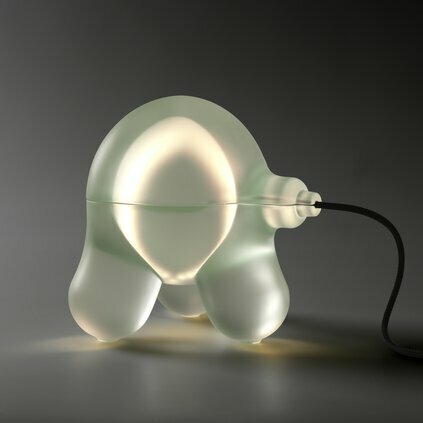 In this case an odd but charming looking ceramic table light. Wally will be introduced bij Cor Unum this coming year in 2019. Welcome, Wally! Pressed glass is glassware produced by mechanically pressing molten glass into a plain mold by means of a plunger. Pressed glass can generally be distinguished because of its mold seams, but in my opinion this gives all its charm to the product. 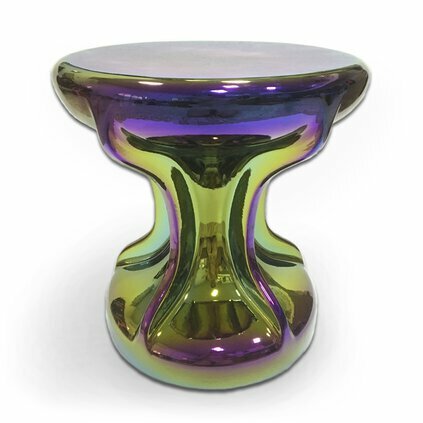 The use of a plunger enabled glassmakers to spread the thick, molten glass quickly throughout the mold before it solidified and thereby made it possible for them to shape the glass into intricate forms with elaborate designs. 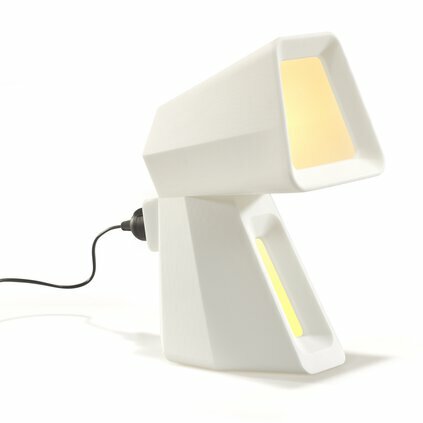 The pressing process became the single most important factor in making glassware affordable for everyday use, in this case the tiny table lamp Nemo. The Yarn Box collection is an exploration in the relation in stringing beads and bindings ribbons. It was about the essence of creating a basic structure in a pattern. The yarn box stands for ‘playfulness’ skill of the hand, mastery of form and technique. The collection consist of round and rectangle carpets and comes in 3 printed designs, and several sizes. 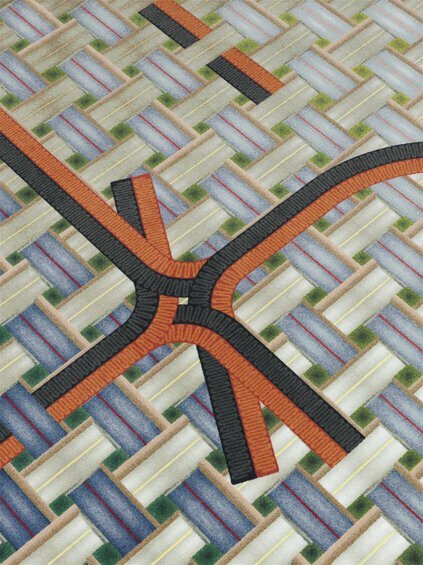 Claire Vos: “In my Tangle carpet design, the imaginary weaving structure holds the carpet visually together. 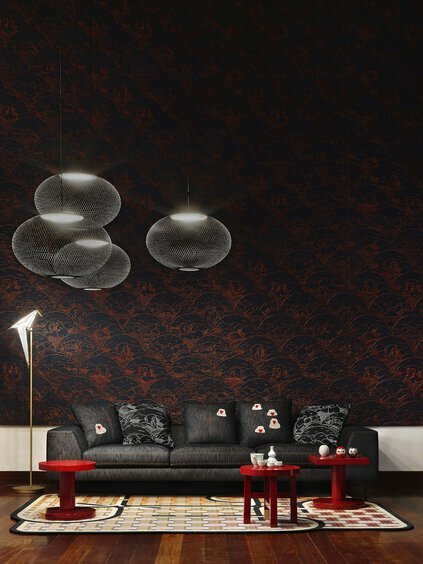 These three designs reflect my personal commitment to the richness of color in to room decoration”. The Yarn Box Collection by MOOOI will be presented Salone del Mobile, Milan, 2019. Where is the image being used?